Pain Physicians NY (Brooklyn & NYC locations) provides a full range of advanced pain management services including Acupuncture. We help our patients return to a healthy and pain-free lifestyle. We provide the most effective acupuncture treatment for back pain, anxiety, weight loss. Acupuncture as one of the traditional Chinese medicine is a technique that tries to balance the flow of energy, known also as CHEE. Chinese has practiced this technique for centuries, but is has also spread to other parts of the world, and Western medicine has been using acupuncture as a pain relieving method over the past few decades. Acupuncture involves the insertion of thin needles into specific points of the human body, as it is believed that the flow of energy throughout the body runs into specific pathways known as meridians. By inserting thin needles into these meridians, acupuncture practitioners believe that this energy flow will re-balance. Many Western acupuncture practitioners believe that by inserting thin needles into these meridians, the nerves, muscles and connective tissue are stimulated, boosting natural painkillers, increasing the blood flow and relieving this way the pain. Acupuncture as a traditional Chinese medicine is mostly used for pain treatment. It may sound weird that needles can help you reduce the pain, without using any painkillers, but studies have shown that acupuncture as one of the treatment methods of pain is very successful. For What Type of Pain Is Acupuncture Recommended For? Headaches –such as migraine or tension headaches, etc. Infections – the thin needles that are inserted into your body in specific meridians need to be sterile and disposable. Reused needles can expose you to various infections. Organ injury – this complication is extremely rare and can occur if needles that are used for acupuncture are inserted too deeply into the body. When acupuncture, is performed by a well – trained and certified acupuncture practitioner, this complication is less likely to occur. Soreness – at the needle sites sometimes soreness, bruising or even minor bleeding can occur. Is Everyone Suitable For Acupuncture Treatments? Acupuncture is a safe way for treating pain. However, acupuncture is not recommended for everyone, better to say that certain types of acupuncture are not recommended for everyone. Pregnant women, patients who have a pacemaker or patients who have bleeding disorders should let the acupuncture practitioner know before they start the treatment. It is believed that some types of acupuncture stimulate delivery, so when acupuncture treatment is performed in pregnant women, it can result in preterm delivery. For patients who have a pacemaker, acupuncture that involves mild electrical pulses is not recommended as it can interfere with the pacemaker. Patients who have bleeding disorders or take blood thinners, are more likely to have bruising and bleeding at the sites of needle insertions. An Acupuncture treatment takes about an hour. During the treatment, you need to lay down on a treatment table, while the Acupuncture practitioner inserts the needles into specific parts of your body. Each needle is used only once. When all the needles are inserted you should lie still for about 15 minutes before the needles are removed. It is good to know that Acupuncture needles are very thin, so normally they cause no discomfort at all, or just very little discomfort while they are inserted into your body. In a typical Acupuncture treatment, 5-20 needles are used. 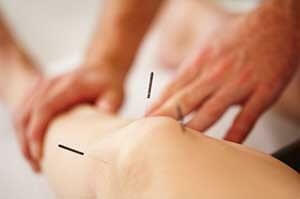 Your Acupuncture specialist can sometimes gently move, rotate or twirl the needles. He/she can also apply heat or mild electrical pulses to the needles while treating you. When the needles are removed (usually after 10-20 minutes) there is no discomfort at all. Some people after an Acupuncture treatment feel more energized and relaxed. However, not everyone responds well to acupuncture treatments. If, after four treatments you don’t feel any improvement of your pain, then Acupuncture as a treatment option may not be suitable for you. For better results, it is recommended to have one or two Acupuncture treatments a week. Usually, about eight treatments in one month are enough for relieving your pain. Often, along with the Acupuncture treatments, Chinese herbs are prescribed in order to help your body rebalance its energy. Since Acupuncture has few side effects, it is well worth a try, when you are experiencing pain and can’t control it with other treatment options. Studies have shown that Acupuncture works better in open minded people and optimistic people who are willing to give a try to this traditional Chinese treatment method. If, Acupuncture is recommended to you, be optimistic and try it. You can’t lose anything.